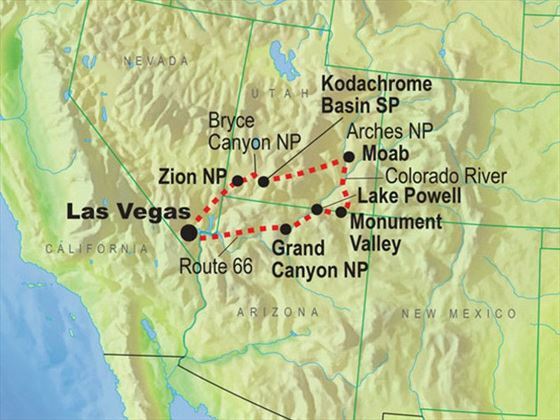 A family holiday of a lifetime, on this small group tour (max 13 people) of the canyons of western America. Your expert tour leader will guide you through nine days of exploring, camping and fun activities. One night will be spent in a traditional Navajo mud hut, four nights will be camping under the stars in the middle of the stunning landscapes, and for three nights you can relax in hotels. 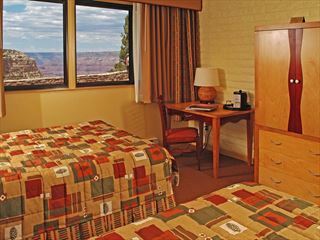 You will have your breath taken away with views of the Grand Canyon, the Valley of Fire, the Colorado River at Horseshoe Bend and the Hoover Dam. 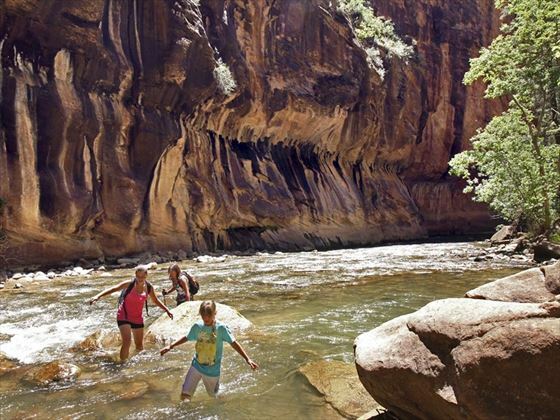 You can choose from hiking various trails in the stunning National Parks of Bryce and Zion, and opt to go horseback riding or river tubing. Join your group this evening in Vegas. You will be heading west in the morning, so can you choose to add a few days in Vegas before the tour starts (or perhaps afterwards, at the end of the tour) if you would like to enjoy the attractions of this fun-filled city. First stop on your journey west is the aptly named Valley of Fire State Park, with its red standstone formations which glimmer in the sun. 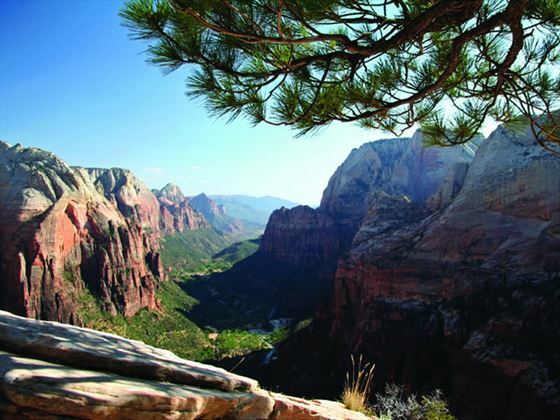 Then you will head to the spectacular Zion National Park, where the adventurous can take a hike to the famed Angels Landing for amazing 360 degree view of the magnificent landscape. Or you can choose to take a different trail, through the narrows where you can wander in-between towering walls, enjoying the cool shadows of the canyon. On arriving at Bryce National Park you will be blown away by the amazing stone structures sculpted over thousands of years into spires, arches, mazes and fantastical shapes known as “hoodoos”. The Native American myths describe these bizarre shapes as “Legend People” who were turned to stone for their sins. Here you can choose either to go horse riding or hike on a variety of trails ranging from easy to more strenuous. On the Navajo trail you can hike right through these unique rock formations. The easier Queen’s Garden trail is a lovely stroll. Or you can choose just to remain on the rim and take advantage of this amazing photo opportunity. You will spend the night at a lovely campsite in the nearby Kodachrome Basin State Park. En route to Lake Powell pause at Horseshoe Bend for one of the most spectacular views of the Colorado River. 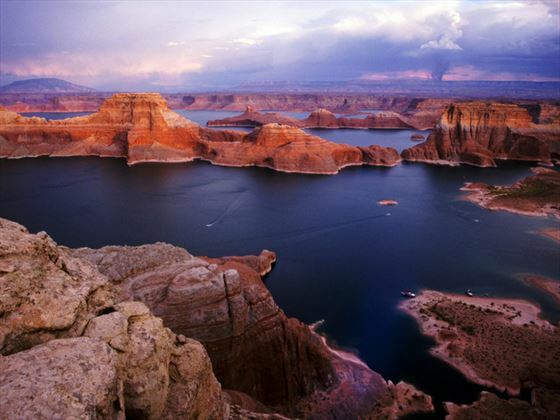 Lake Powell was created by the construction of the Glen Canyon Dam, and has a shoreline which stretches longer than the west coast of the USA. The lake is a haven for watersports but if you prefer you can just relax in one of the many sandstone coves. After a day of fun in the sun, you will have another magical evening camping out under the stars. 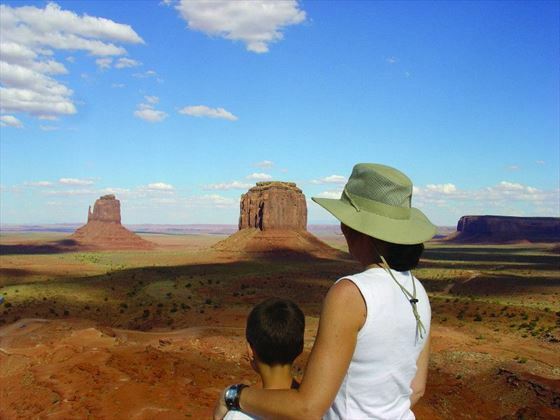 You will spend today in one of the most iconic landscapes of the states – Monument Valley – used as the set for countless movies. You will have a Navago guide taking you through the backroads, teaching you about the rich Navajo history and be entertained by their stories and myths. After an fascinating day you will have an extraordinary night camping in one of their traditional mud huts – the mud Hogan. Saving the best and certainly the biggest until last, it is now time to visit the Grand Canyon. Up to 18 miles wide and 1 mile deep, it is no wonder this is described as one of the seven natural wonders of the world. 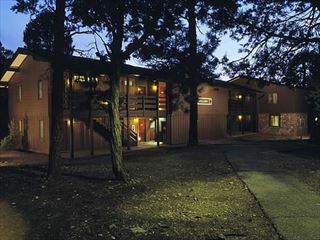 You will be spending two nights here, so have lots of time to explore the cliff-top walking trails and observation spots. You can also opt for a helicopter flight for spectacular birds-eye views. 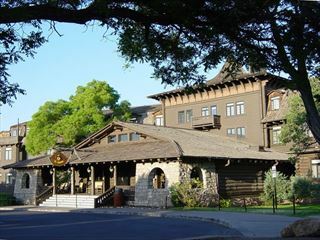 Enjoy a beautiful sunset over the canyon whilst enjoying an included pizza dinner. The finale of this tour is a slice of pure Americana as you travel along a section of the original Route 66, stopping in the charming and quirky town of Seligman – full of Americana road trip memorabilia and the option to grab a bite at the Snow Cap Diner. Before reaching your final destination of Las Vegas, you will stop to enjoy awe-inspiring views of the Hoover Dam. You can either fly home this evening (please don’t book a flight departing before 9pm) or stay on for a few days to enjoy the spectacle of Las Vegas. Four nights on this tour will be spent camping so that you can experience the most breath-taking natural scenery at close quarters. Campgrounds are selected either for their scenic beauty or for their convenience to the places you’ll explore. You will have one night for a truly unique experience, sleeping in a traditional Navajo mud hut, and three nights will be spent in hotels, as shown in the itinerary. Three nights will be spent in hotels on this tour, as shown on the itinerary, and here you will be able to choose when and where you eat, with all meals payable locally. In addition to this you should also budget for optional activities you would like to participate in. Some sample costs are listed in the Whats Included section.